Despite latest digital possibilities, manual pay desks are still used in public transportation to assort coins quickly and uncomplicatedly. We have integrated the mechanical coin unit into a compact and modern plastic housing. The coin return has also gotten a new placement, facing the customer. The housing with its rounded corners fits discreetly into its environment close to the driver and harmonises very well with the Board computer that has also been developed by us. 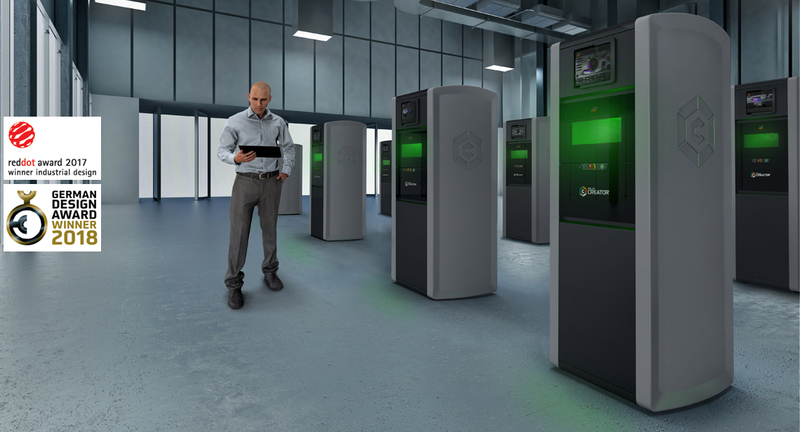 The innovative 3D-metal printer ORLAS CREATOR is the next step in the development of additive manufacturing technology. The system features a highest print quality and extraordinary functionality. An innovative build-platform design enables up to 30% faster production speeds compared with traditional platforms. The CREATOR is controlled by an in-house developed software and a latest user-friendly interface technology. The platform convinces not least because of its modern design using precious materials and smart detailed solutions. Its compact housing as well as low investment costs makes the system cost-attractive alternative to small and medium-sized enterprises. Conceptual development and design implementation of user navigation through all application processes of a board computer (e.g. system configuration, route/timetable, ticketing, monitoring of vehicle). Complex content displayed on three horizontal movable surfaces. Laser cutting unit with 3kW power output and with workspace of 1×1 meter. A special innovation is the development of foldable and sliding door which enables an easy operation and loading. Development of an intuitive user interface for the complete 3D printing process. The installation space is an interactive user interface, diverse parameters can be configured and adjusted directly. The operation is possible only in the online mode, while offline mode allows monitoring even multiple devices thanks to the cloud manufacturing. Development of on-board computer system based on an Android- tablet. The perfect integration of the tablet solution with its own housing and a driver’s display that can be rotated by 180° ensures perfect positioning within the vehicle. The generous design of the customer interface puts the passanger at the centre of attention. The customer interface including ticketing, bar code reader or display are easily visible on one layer.